Dual Channel x8 PCIe 2.0 to 10Gb Ethernet, Full Height, LC SFP+ SR Interface (SFP+ modules included), 3 year warranty. 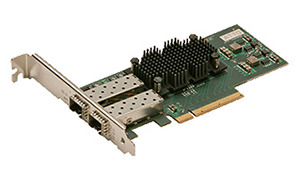 A single NS12 dual-port FastFrame adapter in a server provides an affordable, high-performance small network or storage solution for two clients. Or, link aggregation may be used to reduce server-to-switch bottlenecks.